Seven months after he added a Best Film Oscar to his Turner Prize, Steve McQueen returns with a new film and sculptural installation spread across two sites at Thomas Dane Gallery. That these works went on display while the London Film Festival and the Frieze Art Fair were taking place seems apt, as no-one else currently straddles the worlds of cinema and contemporary art as successfully as McQueen. The new film is Ashes, a looping sequence featuring the eponymous figure, a young black man stood in a small orange boat at sea in the Caribbean. Shot with a Super 8 camera, the vibrant images maintain a powerful sense of nostalgia – like an old home video of a fishing trip – with the sunlight and splashes of water dappling our view. McQueen’s fascination with the male body – think of the naked figures in Bear (1993) or the starving flesh of Bobby Sands in Hunger (2008) – is again evident with the confident, carefree Ashes rapturously pictured. The artist’s distinctive attention to rhythm and movement – think of the subway rides in Shame (2011) or the circling of Static (2009) – is also notable, the camera rolling hypnotically with the undulating waves. These captivating visuals are complicated by the film’s voiceover, in which two of Ashes’ friends recount his violent death. Ashes, we learn, found some drugs on a beach, only to be hunted down and shot as a consequence. In a strange way, the investigation carried out by his killers, who in search of the drugs drove around Grenada asking, ‘Who is Ashes?’ mimics our own attempts to assimilate the smiling man on-screen with the tragic victim of the voiceover. The installation – a double-sided screen in the centre of the gallery space – further encourages multiple perspectives on this man’s story. Ashes are often tossed into the sea in memory of a loved one, but the footage McQueen incorporates in this work represents the recovery or trace of a past project. It dates from 2002, when Dutch cinematographer Robby Müller (who has worked with the likes of Wim Wenders and Lars von Trier) photographed McQueen’s film Caribs’ Leap in Grenada. When McQueen returned to the island in 2013, he heard of Ashes’ death. The old footage was resurrected and the aural accounts recorded as an accompaniment. The second work in this show, Broken Column, constitutes McQueen’s first venture into sculpture. It comes in two parts. The first, nearly seven feet tall, is a round black granite column, the top of which is abruptly severed, sat on a pedestal and displayed on a wooden packing crate. The second part of the sculpture, shown in a separate room, is identical in form but a quarter of the size, and is presented within a Perspex box. This smaller structure is also distinctly grubby – dust is a listed component – and has a pile of dirt at the base of its column. 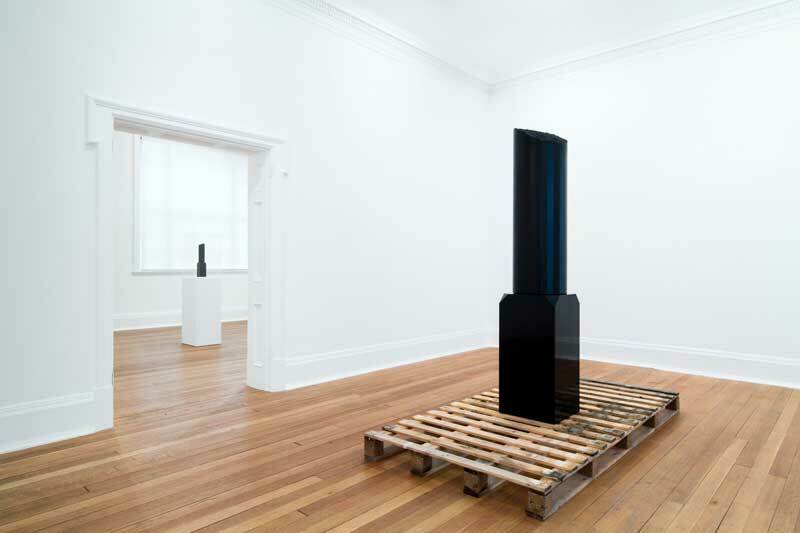 If the relationship between these two columns is intriguing – one looks like it was broken in transit, while its smaller sibling actively preserves its dirt and severance within a display case (for ashes can be easily blown away and forgotten) – then the connections between the sculptural installation and the film are even more evocative. Broken Column seems to stand as a monument to Ashes, and perhaps to the curtailed lives of other young black men. Whereas the fleeting sun-filled film is looped endlessly, as if prolonging forever the brief life it depicts, the strong forms of the sculpture are cut short in brutal and surprising fashion. Together, these haunting new works question which stories are told, which images are chosen and which structures are built when we memorialise a life. Steve McQueen is at Thomas Dane Gallery, London, until 15 November 2014.